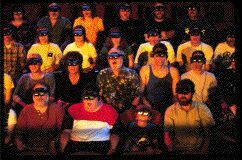 The Institute for the Exploration of Virtual Realities, i.e.VR, is a newly formed institute within the University Theatre and the Department of Theatre & Film at the University of Kansas. Its goal is to explore the uses of virtual reality and related technologies. While the primary application currently under study is theatre production and performance, the possibility of exploring VR applications in other fields is also being actively pursued. This and related pages will be updated frequently to include up-to-date information about the progress of our projects. WINGS; Our next VR/Theatre production. Keep track of our progress as we prepare to mount a production in which the entire audience will wear i-glasses! from Virtual i-O! 3D Video in Theatre Production. Check our recent work in using 3-D video to record, transmit and create new theatre productions. A VRML world index to The Adding Machine: A Virtual Reality Project. Use a VRML browser to cruise through this virtual model of the stage and backstage areas. This is a Virtus Alpha World created with the new Virtus WalkThrough VRML. Our recent production in which VR technology was used as the scenographic medium. Actual Samples of Virtual Settings from The Adding Machine. Placeholder was a Virtual Reality project produced by Interval Research Corporation and The Banff Centre, and directed by Brenda Laurel and Rachel Strickland. Extempo Systemsdesigns and builds synthetic actors. The Oz Project at Carnegie-Mellon University using technology and art to create high-quality interactive drama.